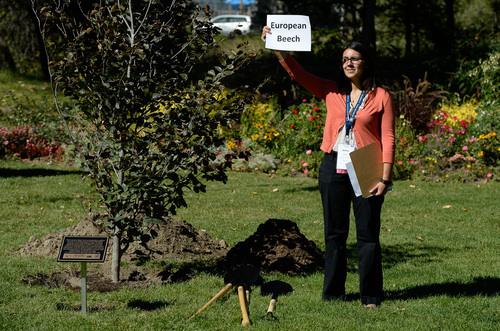 Francisco Kjolseth | The Salt Lake Tribune Organizer Melissa Jenkins holds a sign representing one of four trees to be planted during a ceremony at the International Peace Gardens in Salt Lake City, on Sunday, Oct. 5, to commemorate the International Union of Forest Research Organizations (IUFRO) 24th World Congress, which kicks off this weekend. Four trees were planted as a gift to the host city during the ceremony, which is an IUFRO tradition -- Cedar of Lebanon, Pinyon pine, American chestnut and European beech. Francisco Kjolseth | The Salt Lake Tribune Kai McArthur, 11, of Hawaii, joins Gerhard Mannsberger, left, chief of the Austria Forest Service, and Niels-Elers Koch, president of the International Union of Forest Research Organizations (IUFRO), during a tree planting ceremony at the International Peace Gardens in Salt Lake City, on Sunday, Oct. 5. The IUFRO 24th World Congress kicked off Sunday and began with the planting of four trees as a gift to the host city during the ceremony, which is an IUFRO tradition ó Cedar of Lebanon, Pinyon pine, American chestnut and European beech. Kai McArthur, 11, of Hawaii, joins Gerhard Mannsberger, left, chief of the Austria Forest Service, and Niels-Elers Koch, president of the International Union of Forest Research Organizations (IUFRO), during a tree planting ceremony Sunday at the International Peace Gardens in Salt Lake City. The IUFRO 24th World Congress kicked off Sunday and began with the planting of four trees as a gift to the host city. 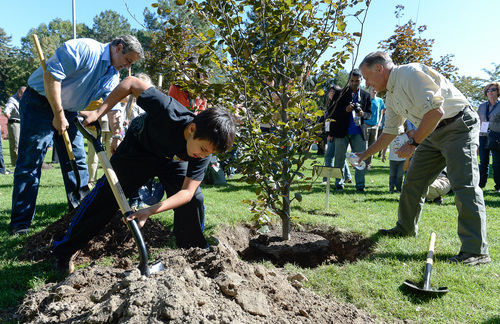 The group planted a cedar of Lebanon, a pinyon pine, an American chestnut and a European beech at the peace gardens. The IUFRO World Congress, which runs through Saturday, is the largest international gathering of forest researchers and practitioners in the world.